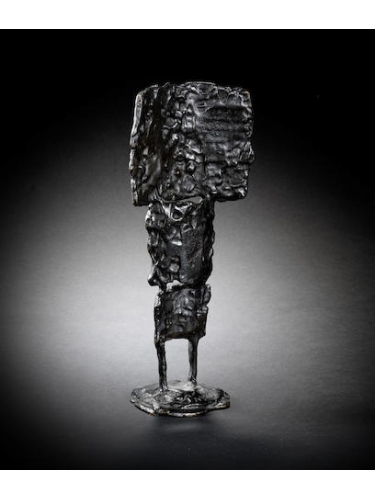 F. E. McWilliam’s work in the 1940's drew inspiration from primitive art, in particular African sculpture. Following army service in India he returned to London to teach at Chelsea School of Art and the Slade where he continued to explore a wide variety of media. During the 50’s his work gradually evolved from an understated, textural and figurative expression towards more symbolic forms, retaining a witty and ironic take on his subject matter. McWilliam’s 1960’s series of angular, recumbent figures directly satirise those of his friend Henry Moore with a natural dexterity and fluency. His approach to sculpture was characterised by a surreal imagination and a tendency to explore a theme thoroughly and then swiftly move on to new ground, often taking on a new medium. McWilliam was born in Banbridge, County Down, Ireland. He studied at Belfast School of Art and at the Slade School of Fine Art. Retrospective exhibitions of his work have been held by the Arts Council of Northern Ireland and Tate Britain. He is represented in many major national collections including Tate and the Museum of Modern Art, New York.